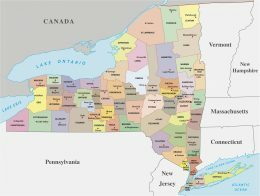 By Rainer Lesniewski This map of New York state shows cities considered by some to be part of upstate New York. By now, late September, I’m sure you’ve had an argument with someone from “the city” (as if other cities don’t exist), or New York City, that any geographical point north of NYC is considered upstate New York. The same argument is made by people who live on Long Island. I am here to prove the “downstaters” wrong and to act as a voice for those north of Westchester County. Geography should be absolute, not relative. The Americas are labeled from the equator: North, South and Central America. Using the same methodology, we can label Syracuse, my homeland, as the center of New York state. High school and college teachers always warn against citing Wikipedia in papers, and here is a prime example: On the upstate New York Wikipedia page, it says, “Upstate New York is the portion of the American state of New York lying north of the New York metropolitan area.” Clearly, someone from the metropolitan area has hacked Wikipedia to display false information. Students have varying degrees of delusion. My ears bleed upon hearing, “I’m from upstate, in Poughkeepsie,” which lies south of the New York-Pennsylvania state line. Poughkeepsie is downstate; it sits below the majority of New York’s area. According to the 2010 census, the state of New York had a population of 19,378,102 people. At the same time, NYC had a population of approximately 8,175,133 people. NYC had about 42 percent of the state’s population clustered in 302.65 square miles. In comparison, the entire state has 47,126.40 square miles. Instead of thinking that nothing exists north of Westchester County, think of that area as the entire rest of the state just waiting to be explored. So next time you hear someone say BU is in upstate New York, politely remind them of where the Bearcat calls its home.